Ginger Pahos, BERNINA fan shared a recent project with me. What a super idea! 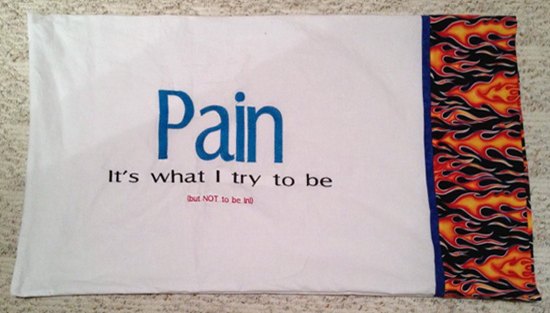 I designed these pillowcases for a young man I met at the hospital I work at. He was so much like my nephew that I couldn’t help but feel for him. My nephew spent the week moving into the dorms for his first year of college. This young man was supposed to as well but instead he was moving into the hospital to begin his first round of chemo! Even so he kept me laughing anytime I saw him and these pillowcases came out of several of our encounters. 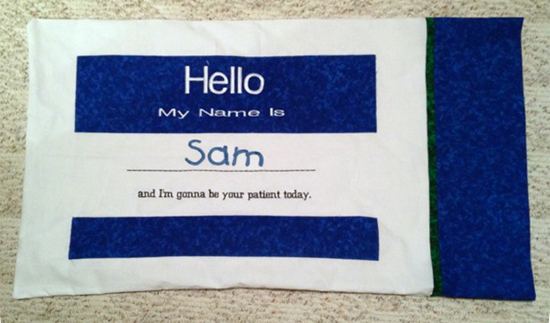 Hello – My Name Is Sam and I’m gonna be your patient today. These were super easy because I created the letting directly in my machine. No software needed! Pain – It’s what I try to be – but NOT to be in!